This article is about the George Harrison song. For other uses, see What Is Life (disambiguation). "What Is Life" is a song by the English musician George Harrison, released on his 1970 triple album All Things Must Pass. In many countries, it was issued as the second single from the album, in February 1971, becoming a top-ten hit in the United States, Canada and elsewhere, and topping singles charts in Australia and Switzerland. In the United Kingdom, "What Is Life" appeared as the B-side to "My Sweet Lord", which was the best-selling single there of 1971. Harrison's backing musicians on the song include Eric Clapton and the entire Delaney & Bonnie Friends band, with whom he had toured during the final months of the Beatles. Harrison co-produced the recording with Phil Spector, whose Wall of Sound production also employed a prominent string arrangement by John Barham and multiple acoustic rhythm guitars, played by Harrison's fellow Apple Records signings Badfinger. An uptempo composition in the soul genre, "What Is Life" is one of several Harrison love songs that appear to be directed at both a woman and a deity. Harrison wrote the song in 1969 and originally intended it as a track for his friend and Apple protégé Billy Preston to record. Built around a descending guitar riff, it is one of Harrison's most popular compositions and was a regular inclusion in his live performances. Rolling Stone magazine has variously described it as a "classic" and an "exultant song of surrender". "What Is Life" has appeared in the soundtrack for feature films such as Goodfellas (1990), Patch Adams (1998), Big Daddy (1999), Away We Go (2009), This Is 40 (2012) and Instant Family (2018). Harrison's original recording was included on the compilations The Best of George Harrison and Let It Roll, and live versions appear on his album Live in Japan (1992) and in Martin Scorsese's 2011 documentary George Harrison: Living in the Material World. In 1972, Olivia Newton-John had a UK hit with her version of the song. Ronnie Aldrich, the Ventures and Shawn Mullins are among the other artists who have covered the track. Even before his temporary departure from the Beatles in January 1969 (documented in the song "Wah-Wah"), their Apple Records label was an "emancipating force" for Harrison from the creative restrictions imposed on him within the band, according to his musical biographer, Simon Leng. In his "definitive" article on All Things Must Pass for Mojo magazine, John Harris has written of Harrison's "journey" as a solo artist beginning in November 1968 – when he spent time in Woodstock with Bob Dylan and the Band – and incorporating a series of other collaborations through the following eighteen months, including various Apple projects and a support role on Delaney & Bonnie and Friends' brief European tour. One of these projects, carried out intermittently from April to July 1969, was his production of That's the Way God Planned It, an album by Billy Preston, whom Harrison had met during the Beatles' Hamburg years and had recently recruited to guest on the band's troubled Get Back sessions. It was while driving up to a Preston session in London from his home in Esher, Surrey, that Harrison came up with the song "What Is Life". Then I'll try my best to make everything succeed. These lyrics have caused some debate among biographers and music critics, as to whether "What Is Life" should be viewed as a straightforward love song – perhaps a "lovingly crafted paen" to Harrison's wife Pattie, as Alan Clayson puts it – or a devotional song like many of Harrison's compositions. Ian Inglis writes that the song title suggests a "philosophical debate about the meaning of life", yet its rendering as "what is my life" in the choruses "reshapes [the meaning] completely". Theologian Dale Allison finds no religious content in "What Is Life" but notes the "failure of words to express feelings" implied in the opening line ("What I feel, I can't say"), a recurring theme of Harrison's spiritual songs such as "That Is All", "Mystical One" and "Pisces Fish". Joshua Greene, another religious academic, identifies the song as part of its parent album's "intimately detailed account of a spiritual journey": where "Awaiting on You All" shows Harrison "convinced of his union with God", "What Is Life" reveals him to be "uncertain that he deserved such divine favor". Musically, Simon Leng describes "What Is Life" as "Motown-spiced" and a comparatively rare example of its composer's willingness to embrace the role of "entertainer" in his songwriting. In I Me Mine, Harrison recalls that he changed his mind about offering "What Is Life" to Preston once he'd arrived at Olympic Studios and found the singer busy working on more typical material – or "playing his funky stuff" as Harrison puts it. Rather than attempt it with the Beatles during the band's concurrent Abbey Road sessions, he stockpiled the track with his many other unused songs from the period – "All Things Must Pass", "Let It Down", "I'd Have You Anytime" and "Run of the Mill" among them – and revisited it a year later, after completing work on Preston's second Apple album, Encouraging Words. By May 1970, having recently collaborated with "genuine R&B heavy-weights" such as Doris Troy and Preston, as well as participating in the "blue-eyed soul" Delaney & Bonnie European tour, along with Eric Clapton, the previous December, Harrison was well placed to record "What Is Life", Leng observes. With Phil Spector as co-producer and all the Friends team on hand, the song was among the first tracks taped for Harrison's debut post-Beatles solo album; recording took place at Abbey Road Studios in London, during late May or early June. The same core of musicians – Bobby Whitlock, Carl Radle, Jim Gordon, Bobby Keys and Jim Price – would similarly elevate other All Things Must Pass tracks such as "Awaiting on You All", "Art of Dying" and "Hear Me Lord". The recording is defined by Harrison's descending, fuzztone guitar riff, which also serves as the motif for the chorus. The track opens with this riff, which is then joined by Radle's bass and "churning" rhythm guitar from Clapton, before Gordon's drums bring the full band in. During the verses, Gordon moves to a square, Motown-style beat – or "rock-steady Northern soul backbeat" in Leng's words – before returning to the "galloping rhythm" of the more open, "knockout" choruses, and the song is driven equally by Badfinger drummer Mike Gibbins' powerful tambourine work. On "What Is Life", Spector provided what music critic David Fricke terms "echo-drenched theater", in the form of reverb-heavy brass, soaring strings (arranged by John Barham) and "a choir of multitracked Harrisons". The vocals and Barham's contribution, along with a brief slide-guitar commentary from Harrison over the final verse, were overdubbed at Trident Studios, most likely during late August through September. Dated 19 August, Spector's written comments on Harrison's early mix of the song had suggested a "proper background voice" was still needed; like sound engineer Ken Scott, Spector would be impressed with the result, saying, "He was a great harmoniser ... he could do all the [vocal] parts himself" and rating Harrison "one of the most commercial musicians and songwriters and quintessential players I've ever known in my entire career". "What Is Life" was released in late November 1970 as the first track on side two of All Things Must Pass, in its original, triple LP format. Along with "My Sweet Lord" and "Isn't It a Pity", the song had already been identified as a potential hit single by Allan Steckler, manager of Apple's US operation. Backed by another album track, "Apple Scruffs", "What Is Life" was issued as a single in America on 15 February 1971 (as Apple 1828), just as the "My Sweet Lord"/"Isn't It a Pity" double A-side was finally slipping out of the top ten. The front of the single's US picture sleeve consisted of a photo of Harrison playing guitar inside the central tower of his recently purchased home, Friar Park, in Henley-on-Thames. The tower's sole, octagonal-shaped room was an area that Harrison had adopted as his personal temple and meditation space. This picture was taken by photographer Barry Feinstein, whose Camouflage Productions partner, Tom Wilkes, originally used it as part of an elaborate poster intended as an insert in the album package. The poster featured a painting of the Hindu deity Krishna watching a group of naked maidens beside a bathing pond. Harrison apparently felt uncomfortable with the symbolism in Wilkes's design – the Friar Park tower image filled the top half of the poster, floating among clouds above the Krishna scene – so Wilkes abandoned the concept and instead used a darkened photo of Harrison inside the house as the album poster. The more common picture sleeve internationally was a close-up of Feinstein's All Things Must Pass front-cover image, taken on the main lawn of Friar Park. In Denmark, the sleeve featured four shots of Harrison, again with guitar, taken on stage during the Delaney & Bonnie tour. At the end of March, "What Is Life" peaked at number 10 on the Billboard Hot 100 and number 7 on Cash Box's Top 100 chart, making Harrison the first ex-Beatle to have two top-ten hits in the United States. The single was a success internationally, climbing to number 1 in Switzerland and on Australia's Go-Set National Top 60, and reaching the top three elsewhere in Europe and in Canada. In Britain, where Harrison had resisted issuing a single from All Things Must Pass until midway through January, "What Is Life" appeared on the B-side to "My Sweet Lord" – a combination that became the top-selling single of 1971 in that country. "What Is Life" is one of Harrison's most commercial and popular songs – a "spiritual guitar quest" that "became [a] classic", according to Rolling Stone magazine. On release, Billboard magazine's reviewer wrote of "What Is Life" and "Apple Scruffs" as "intriguing rhythm follows-ups" to Harrison's previous single, which were "sure to repeat that success" and "should prove big juke box items". In their Solo Beatles Compendium, authors Chip Madinger and Mark Easter refer to it as an "intensely catchy track" and view its pairing with "My Sweet Lord" in the UK as perhaps the strongest of all of Harrison's singles. Writing in 1981, NME critic Bob Woffinden grouped "What Is LIfe" with "My Sweet Lord", "Isn't It a Pity" and "Awaiting on You All" as "all excellent songs". Reviewing the 2001 reissue of All Things Must Pass, for Rolling Stone, James Hunter wrote of how the album's music "exults in breezy rhythms", among which "the colorful revolutions of 'What Is Life' ... [move] like a Ferris wheel". The following year, in Rolling Stone Press's Harrison tribute book, David Fricke included "What Is Life" among his selection of "essential Harrison performances" (just three of which date from the ex-Beatle's solo years) and described the track as an "exultant song of surrender", abetted by Harrison's "pumping fuzz guitar" and the song's "singalong magnetism". AllMusic's Richie Unterberger similarly praises "What Is Life" for its "anthemic" qualities, "particularly snazzy horn lines", and a guitar riff that is "one more entry in the catalog of George Harrison's book of arresting, low, descending guitar lines". Writing in the book 1,000 Recordings to Hear Before You Die, author Tom Moon refers to "the upbeat single 'What Is Life'" as an example of how Harrison "grabs what he needs from his old band – that insinuating hook sense – and uses it to frame an utterly comfortable metaphysical discourse". Alan Clayson describes "What Is Life" as a seemingly "lovey-dovey pop song" that "craftily renewed the simplistic tonic-to-dominant riff cliché", while Simon Leng credits Harrison's "innate ability to write very fine pop-rock songs" and deems the result "as innovative an exercise in rock-soul as The Temptations' 'Cloud Nine'". Among Harrison biographers, only Ian Inglis is less than enthusiastic, acknowledging that Barham's orchestration and the other musicians give the track "undoubted excitement and energy", but lamenting that the song offers "little overall coherence between words and music". In a 2010 poll to find the "10 Best George Harrison Songs", AOL Radio listeners voted "What Is Life" third behind "My Sweet Lord" and "Blow Away". A similar list by Michael Galluci of Ultimate Classic Rock placed it second (behind "My Sweet Lord"), as Galluci wrote of the track having "a giant pop hook as its guide" as well as "the catchiest chorus Harrison ever penned". In 2009, Matt Melis of Consequence of Sound listed it sixth among his "Top Ten Songs by Ex-Beatles", writing: "it's arguable that Harrison's All Things Must Pass is the best solo album put out by a Beatle. 'What is Life' … with its riff-driven bounce, soaring harmonies on the choruses, and perfectly placed sax and trumpet, [is] probably Harrison's catchiest pop song." In the 2005 publication NME Originals: Beatles – The Solo Years 1970–1980, Adrian Thrills rated it first among Harrison's "ten solo gems", adding: "One of Harrison's greatest guitar riffs – brilliant pop." The song is said to be a favourite of Foo Fighters singer Dave Grohl. In a Rolling Stone readers' poll, titled "10 Greatest Solo Beatle Songs", the song placed fourth, with the editor commenting: "The track is deceptively simple, and more layers become apparent the more often you play it." "What Is Life" has featured in Bruce Pollock's book The 7,500 Most Important Songs of 1944–2000, Treble website's "The Top 200 Songs of the 1970s" (ranked at number 101) and Dave Thompson's 1000 Songs That Rock Your World (at number 247). "What Is Life" was included on the 1976 compilation The Best of George Harrison as well as 2009's Let It Roll: Songs by George Harrison. The song has also been featured in a number of popular movies: Martin Scorsese's Goodfellas (1990), during the "May 11, 1980" sequence; Tom Shadyac's Patch Adams (1998); Sam Mendes' Away We Go (2009); and, more recently, Instant Family (2018). In late 2012, "What Is Life" was used in advance promotion for the film This Is 40, directed by Judd Apatow, although it was omitted from the accompanying soundtrack album. According to Rolling Stone: "Today, many people know it merely as a song from all those soundtracks: it's in This Is 40, Patch Adams, Goodfellas and many more. It's almost as ubiquitous as 'Let My Love Open the Door' or 'Solsbury Hill.'" In Scorsese's 2011 documentary George Harrison: Living in the Material World, "What Is Life" plays over a sequence of 1969 photos of Harrison – with, variously, Preston, Jackie Lomax, the Plastic Ono Band, Clapton and Ravi Shankar – immediately before which, archive footage shows him discussing the restrictions he felt within the Beatles and how the band "had to implode". An alternative studio version of "What Is Life" – in fact, a rough mix of the original backing track with different orchestration (in this case, piccolo trumpet and oboe) – was issued as one of five bonus tracks on the 2001 remaster of All Things Must Pass. In the accompanying booklet, Harrison writes that this orchestral arrangement was discarded because he "didn't like the feel". Speaking to Billboard editor-in-chief Timothy White in December 2000, Harrison explained the reason for the lack of a guide vocal on this version: "I'm playing the fuzz guitar part that goes all through the song. So all I could do on the [initial] take was to give the band the cue line – the first line of each verse – and then go back to playing that riff. So that rough mix without the vocal – I'd forgot all about it …"
In September 2014, this instrumental version also appeared as a bonus track on the 2014 Apple Years 1968–75 reissue of All Things Must Pass. Coinciding with the release, Harrison's widow and son, Olivia and Dhani, held an online competition in which filmmakers were invited to create a video clip for "What Is Life". The winner would receive a $5000 cash prize and their entry would became the official video for the track, appearing on the Harrison YouTube channel and other media platforms. In November, Olivia and Dhani selected Brandon Moore of Oakland, CA, as the winner, for his video featuring dance performances by Emma Rubinowitz and Esteban Hernandez of the San Francisco Ballet. A live version of the song, recorded with Eric Clapton and his band in December 1991, is available on Harrison's 1992 album Live in Japan album. The performance was recorded at Tokyo Dome on 17 December, during the final show of the tour. 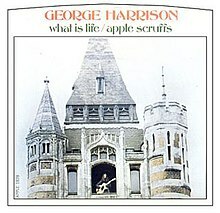 Part of a concert performance of "What Is Life" from Harrison's 1974 North American tour with Shankar is included in Scorsese's George Harrison: Living in the Material World. While challenging the commonly held view that this controversial 1974 tour was a "disaster", Simon Leng writes of a Fort Worth performance of "What Is Life" that was "greeted with a reception that matched anything the New York audience at the Bangla Desh concerts expressed". "I'm a Small and Lonely Light"
English born Australian pop singer Olivia Newton-John recorded "What Is Life", along with a version of Harrison's All Things Must Pass track "Behind That Locked Door", for her 1972 album Olivia. The song was arranged and produced by Bruce Welch of the Shadows and John Farrar, who was Newton-John's regular producer and collaborator during the 1970s. Released as a single in some countries, this version reached the UK top 20 in March 1972, peaking at number 16. [nb 1] It has since appeared on Newton-John compilation albums such as Back to Basics: The Essential Collection 1971–1992 (1992) and The Definitive Collection (2002). In 1971, British easy listening pianist Ronnie Aldrich covered "What Is Life" (as well as "My Sweet Lord") on his album Love Story. That same year, a version by the Ventures appeared on their New Testament album. Also in 1971, a Finnish-language version of the song, titled "Mikä Saa Ihmisen Elämään", was released as a single by local singer Oliver – better known as Veikko Laiho, of the Laiho Trio. In 1992, Nicola Sirkis covered the song on the album Dans La Lune ... A version by Shawn Mullins was released as a single in 1999 and plays over the closing credits of the Adam Sandler movie Big Daddy (1999). Following Harrison's death, Japanese band the Collectors contributed a recording of "What Is Life" to the Gentle Guitar Dreams tribute album, released in May 2002. Classical guitarist Joseph Breznikar recorded a version of the song for his 2003 tribute album George Harrison Remembered: A Touch of Class. In November 2004, Neal Morse released his recording of "What Is Life" on the special-edition version of his album One. Les Fradkin included a cover of "What Is Life" on his 2005 tribute CD Something for George. "What Is Life" was performed live at George Fest 2014 by "Weird Al" Yankovic. The recording is available on YouTube. ^ Her previous single, a US hit in late 1971, was a cover of the Dylan song "If Not For You", based on the Harrison arrangement from All Things Must Pass rather than Dylan's own reading. ^ a b "500 Greatest Albums of All Time: George Harrison, 'All Things Must Pass'", rollingstone.com (retrieved 5 June 2014). ^ a b c d e The Editors of Rolling Stone, p. 201. ^ Leng, pp. 55, 85. ^ Castleman & Podrazik, p. 80. ^ Jim Irvin, "Close to the Edge", Mojo, December 2003, p. 82. ^ "Encouraging Words", Apple Records (retrieved 16 February 2012). ^ a b c d Spizer, p. 222. ^ a b George Harrison, p. 162. ^ a b c d Inglis, p. 26. ^ a b c d e Richie Unterberger, "George Harrison 'What Is Life'", AllMusic (retrieved 22 February 2012). ^ Allison, pp. 124, 158. ^ The Editors of Rolling Stone, p. 187. ^ Madinger & Easter, p. 426. ^ a b c Leng, p. 88. ^ a b c Madinger & Easter, p. 429. ^ Leng, pp. 95–96, 97–98, 99. ^ a b Michael Gallucci, "Top 10 George Harrison Songs", Ultimate Classic Rock (retrieved 28 March 2014). ^ a b Leng, p. 87. ^ a b c d Clayson, p. 296. ^ Madinger & Easter, pp. 427, 429. ^ George Harrison: All Things Must Pass (album), The Beatles Bible (retrieved 20 October 2012). ^ George Harrison: What Is Life, The Beatles Bible (retrieved 16 October 2012). ^ Olivia Harrison, p. 282. ^ a b Spizer, p. 220. ^ Castleman & Podrazik, pp. 99, 352. ^ Spizer, pp. 226, 231. ^ Spizer, pp. 221, 226–28. ^ Peter Doggett, "The Apple Years", Record Collector, April 2001, p. 36. ^ Castleman & Podrazik, p. 352. ^ Jillian Mapes, "George Harrison's 10 Biggest Billboard Hits", billboard.com, 29 November 2011 (retrieved 4 June 2014). ^ a b "George Harrison – What Is Life", hitparade.ch (retrieved 14 April 2014). ^ a b "Go-Set Australian charts – 8 May 1971", poparchives.com.au (retrieved 13 April 2014). ^ "George Harrison (Song artist 225)", Tsort pages (retrieved 16 October 2012). ^ Badman, pp. 22, 59. ^ Castleman & Podrazik, p. 99. ^ Dan Lane, "The biggest selling singles of every year revealed! (1952–2011)", Official Charts Company, 18 November 2012 (retrieved 3 June 2014). ^ "Spotlight Singles", Billboard, 20 February 1971, p. 62 (retrieved 13 October 2013). ^ James Hunter, "George Harrison All Things Must Pass 30th Anniversary reissue", Rolling Stone, 29 March 2001; quoted in The Super Seventies "Classic 500", George Harrison – All Things Must Pass (retrieved 19 October 2012). ^ The Editors of Rolling Stone, pp. 196–201. ^ Boonsri Dickinson, "10 Best George Harrison Songs", AOL Radio, April 2010 (retrieved 27 July 2012). ^ Matt Melis, "List 'Em Carefully: Top Ten Songs by Ex-Beatles", Consequence of Sound, 8 April 2009 (retrieved 28 March 2014). ^ Chris Hunt (ed. ), NME Originals: Beatles – The Solo Years 1970–1980, IPC Ignite! (London, 2005), p. 23. ^ a b Andy Greene, "4. George Harrison – 'What Is Life'", rollingstone.com, 5 June 2013 (retrieved 30 May 2015). ^ "George Harrison 'What Is Life'", Acclaimed Music (retrieved 9 December 2014). ^ Inglis, pp. 65, 128. ^ a b "George Harrison: Soundtrack", IMDb (retrieved 16 October 2012). ^ "This Is 40 Official Trailer #2 (2012)", YouTube, August 2012 (retrieved 16 October 2012). ^ Stephen Thomas Erlewine, "Various Artists This Is 40 (Original Motion Picture Soundtrack)", AllMusic (retrieved 3 June 2014). ^ George Harrison: Living in the Material World, Disc 2; event occurs between 13:48 and 14:50. ^ George Harrison's liner notes, booklet accompanying All Things Must Pass reissue (Gnome Records, 2001; produced by George Harrison & Phil Spector), p. 11. ^ Joe Marchese, "Give Me Love: George Harrison’s 'Apple Years' Are Collected On New Box Set", The Second Disc, 2 September 2014 (retrieved 26 September 2014). ^ "Genero.tv 'What is Life' Winner Announced". georgeharrison.com. Retrieved 8 April 2019. ^ "Dancers in Yellow Frolic Around the Woods in the Official Video for the George Harrison's 'What Is Life'". Laughing Squid. Retrieved 8 April 2019. ^ "George Harrison - What Is Life (Official Music Video)". YouTube. George Harrison. Retrieved 8 April 2019. ^ Stephen Thomas Erlewine, "George Harrison Live in Japan", AllMusic (retrieved 20 October 2012). ^ Madinger & Easter, pp. 483, 484. ^ Badman, pp. 471, 473. ^ George Harrison: Living in the Material World Disc 2; event occurs between 50.51 and 51.49. ^ Jim Miller, "George Harrison: Dark Horse (LP Review)", Rolling Stone, 13 February 1975, p. 180. ^ "Behind That Locked Door", wer-singt.de (retrieved 9 October 2012). ^ "Albums: Olivia", onlyolivia.com (retrieved 9 October 2012). ^ Label credit, "What Is Life / I'm a Small and Lonely Light" single, Interfusion Records, 1972. ^ The New Rolling Stone Encyclopedia of Rock & Roll, pp. 709, 887. ^ a b "Artist: Olivia Newton-John", Official Charts Company (retrieved 4 June 2013). ^ The New Rolling Stone Encyclopedia of Rock & Roll, p. 709. ^ Joe Viglione, "Olivia Newton-John If Not for You", AllMusic (retrieved 4 June 2014). ^ "Olivia* – Back to Basics: The Essential Collection 1971–1992", Discogs (retrieved 14 June 2014). ^ Heather Phares, "Olivia Newton-John Definitive Collection", AllMusic (retrieved 13 June 2014). ^ Al Campbell, "Ronnie Aldridge Love Story / The Way We Were", AllMusic (retrieved 16 September 2012). ^ Bruce Eder, "The Ventures New Testament", AllMusic (retrieved 4 August 2012). ^ "What Is Life – Mikä Saa Ihmisen Elämään", Finnpicks, 3 March 2011 (retrieved 16 October 2012). ^ "George Harrison Cover Songs", The Covers Project (retrieved 4 August 2012). ^ "Shawn Mullins – What Is Life", Discogs (retrieved 14 June 2014). ^ Stephen Thomas Erlewine, "Original Soundtrack Big Daddy", AllMusic (retrieved 16 October 2012). ^ "Various Artists Gentle Guitar Dreams", CD Japan (retrieved 15 September 2012). ^ "George Harrison Remembered: A Touch of Class – Joseph Breznikar", Second Hand Songs (retrieved 19 September 2012). ^ "'What Is Life' – George Harrison", Second Hand Songs (retrieved 16 October 2012). ^ "George Harrison/Beatles Vocal Tribute CDs", lesfradkin.com (retrieved 16 October 2012). ^ "Weird Al Covers George Harrison's "What is Life" at George Fest 2014"
^ "George Harrison – What Is Life", austriancharts.at (retrieved 14 April 2014). ^ "George Harrison – What Is Life", ultratop.be (retrieved 14 April 2014). ^ "RPM 100 Singles, 17 April 1971", Library and Archives Canada (retrieved 14 April 2014). ^ "George Harrison – What Is Life", dutchcharts.nl (retrieved 14 April 2014). ^ "George Harrison: Chart Action (Japan)", homepage1.nifty.com (retrieved 11 April 2014). ^ Search: "What Is Life", Flavour of New Zealand/Steve Kohler, 2007 (retrieved 14 April 2014). ^ "George Harrison – What Is Life", norwegiancharts.com (retrieved 14 April 2014). ^ "SA Charts 1969–1989 Songs (W–Z)", South African Rock Lists, 2000 (retrieved 14 April 2014). ^ "George Harrison > Charts & Awards > Billboard Singles", AllMusic (retrieved 11 April 2014). ^ Whitburn, Joel (1993). Top Adult Contemporary: 1961-1993. Record Research. p. 106. ^ Frank Mitchell (ed. ), "The Singles Chart", Record World, 27 March 1971, p. 31. ^ "Single – George Harrison, What Is Life", charts.de (retrieved 14 April 2014). ^ "RPM 100 Top Singles of '71", Library and Archives Canada (retrieved 3 June 2014). ^ "Dutch charts jaaroverzichten 1971" (in Dutch), dutchcharts.nl (retrieved 3 June 2014). ^ "Search by Artist > Olivia Newton-John", irishcharts.ie (retrieved 14 June 2014). ^ Whitburn, Joel (1993). Top Adult Contemporary: 1961–1993. Record Research. p. 175. George Harrison: Living in the Material World DVD, Village Roadshow, 2011 (directed by Martin Scorsese; produced by Olivia Harrison, Nigel Sinclair & Martin Scorsese). John Harris, "A Quiet Storm", Mojo, July 2001. Tom Moon, 1,000 Recordings to Hear Before You Die, Workman Publishing (New York, NY, 2008; ISBN 978-0-7611-5385-6). The New Rolling Stone Encyclopedia of Rock & Roll, Fireside/Rolling Stone Press (New York, NY, 1995; ISBN 0-684-81044-1). Bobby Whitlock with Marc Roberty, Bobby Whitlock: A Rock 'n' Roll Autobiography, McFarland (Jefferson, NC, 2010; ISBN 978-0-7864-6190-5).